ZDDPlus Oil Additive, Is designed for car engines before 1989. After 70 plus years, the EPA mandated that all domestic oil producers remove ZDDP (Zinc Dialkyl Dithio Phosphate) from all conventional and synthetic motor oil. If your engine was designed before 1989 the non-roller lifters require ZDDP to avoid premature deterioration. ZDDP also alters bearing and journal surface characteristics to prevent metal to metal contact. Under extreme conditions like a high performance motor, ZDDP reduces the tendency of parts to scuff or gall under heavy loads. Simply add ZDDP-Plus to every 4-5 quart oil change and your motor will be protected from metal to metal contact. Add one 4 ounce bottle to a 4-5 quart oil change modifier to eliminate and metal-to-metal contact . As part of an effort to reduce vehicle emissions, the U.S. EPA offers vehicle manufacturers "credits" for early implementation as well as penalties for violation of emission reduction standards. The EPA's program called for 100,000-mile catalytic converter life by 2004, 120,000 miles by 2007, and 150,000 miles by 2009. To achieve these goals, automotive manufacturers have pressured their oil suppliers to remove substances from motor oils that would shorten the service life, including the proven EP (extreme pressure) additive ZDDP (zinc dialkyldithiophosphate). Zinc and phosphorus from the ZDDP can be present in small amounts in the exhaust gas of an engine depending on the amount of oil which is consumed in combustion. These elements can coat the catalyst reducing the amount of catalyst exposed to the exhaust gases, ultimately increasing emissions at the tailpipe. As a result of the EPA mandate, the ZDDP level in engine oils has been declining since the mid-1990s, roughly coinciding with the implementation of OBDII. ZDDP has been an important additive to engine oils for over 70 years, and has an excellent track record at protecting the sliding metal-to-metal cam lifter interface. Historically, ZDDP has been added to oils in amounts resulting in approximately 0.15% phosphorus, and 0.18% zinc. ZDDP protects by creating a film on cams and flat lifter contact points in response to the extreme pressure and heat at the contact point. The film of zinc and phosphorus compounds provides a sacrificial wear surface protecting the base metal of the cam and lifter from wear. In the course of normal service, this conversion of ZDDP to zinc and phosphorus compounds depletes the ZDDP level in the oil. Studies show that depending on the specific engine and severity of duty, after 2000-4000 miles of operation, the level of ZDDP can drop below that considered adequate to provide wear protection to the cam and lifters. ZDDP is an important engine oil addictive. It is widely known for protecting its sliding metal-to-metal cam lifter interface. It has been added to engine oil in certain amounts for over seven decades. In the past, auto manufacturers have demanded that it be removed from engine oil as it results in increasing emissions at the car tailpipe. The demand was as a result of the United States EPA program that called for increased catalytic converter life. As a result EP additive ZDDP known in full as zinc dialkyldithiphosphate; has been removed systematically over the years. This has happened toe to toe with the OBDII introduction and implementation. It has been proven that the addition of ZDDP helps to protect the engine by developing a film on cams and flat contact points to shield from extreme pressure and heat at the contact point. This film protects the base metal of the cam and lifter from wear. During normal service, ZDDP becomes phosphorus and zinc compounds, thus the ZDDP depletes. Studies have shown that a certain level of ZDDP is required or else depending on the extent of use of the engine, at around 3000 miles of operation, give or take 1000; ZDDP levels can drop below adequate levels and cease to provide protection like it should. “According to the SAE Tech Bulletin # 770087  , operation of a flat tappet engine without adequate EP additives such as ZDDP quickly leads to lifter foot scuffing and cam lobe wear. Camshafts are typically only surface hardened leaving the core ductile for strength”. The experts say that once the cam lobe wear is up to 0.0002, the degradation that follows is fast and usually disastrous. Cars equipped with flat tappet cams need ZDDP for protection at their high-pressure points. The newly manufactured cars have roller rockers and as a result, ZDDP is not needed in those applications. Enter the new Plus protection - ZDDPlus oil addictive. ZDDPlus oil additive has the correct level of ZDDP an engine requires. 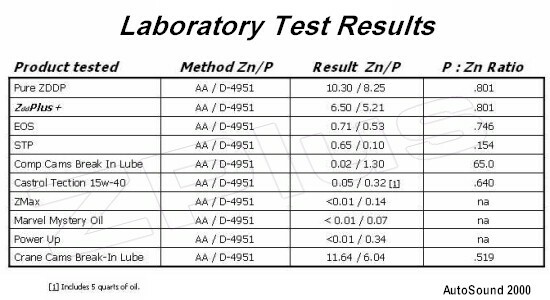 It gives at least 0.19% of zinc and 0.14% phosphorous when a 4oz. bottle is introduced to a regular 5 quart oil change. This is the same quantity in pre-OBDII oils. The use of ZDDPlus gives complete control over the level introduced into the engine oil which is best for maximum performance. ZDDPlus will help keep combustion particles from clumping. Experts have recorded it as the best classic engine protector. Simply add a 4 ounce bottle at every oil change and enjoy full protection throughout the life of your oil. Using high detergent oils reduces the friction reduction that the ZDDPlus affords; it’s better to stick to what works right! ZDDPlus Canada Auto Parts Canada Online is the Leading Canadian Reseller for ZDDPlus Oil additives. Call us on 1-800-265-5787 and be in full control of your classic engine protection. ZDDPlus Canada knows what’s right for your engine. Call the leading auto part resellers for original, quality ZDDP today. ZDDPlus is that little thing that matters! Get it today! SAVE YOUR CLASSIC CAR MOTOR . HELLO ALL CLASSIC CAR GUY,S AND GIRLS . I HAVE DONE GREAT REVIEWS ON THIS PRODUCT. AND , WHAT THE GAS COMPANY,S HAVE REMOVED FROM THE GASOLINE. YOU CAN REPLACE IT WITH THIS ZDDPLUS OIL ADDITIVES AND IT IS SHIPPED OUT OF ONTARIO. TO YOUR DOOR. THIS ADDITAVE IS ADDED TO YOUR OIL . AT EVERY OIL CHANGE. THIS IS FAR CHEAPER THAN , TOWING YOUR CAR HOME , PLUS HAVING TO REPLACE YOUR CAM SHAFT , BEARINGS . AND POSSIBLY A COMPLETE MOTOR JOB. WHICH NONE OF US WANTS TO DO . I,D PERSONALLY FEEL SAFE , THAN SORRY. SAFE CRUISING GUY,S AND GIRLS . SINCERELY RALPH SMITH . MISSISSAUGA ON.